Do you love badass rock stars? Yeah, me too. 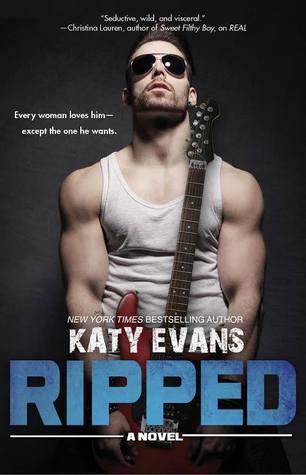 With Mackenna Jones from Ripped by Katy Evans you’ll get that plus a story that will hold your interest, push and pull at your emotions, and satisfy your desire for both romance and spectacular heat. Mackenna and Pandora have a past that ended badly and for all the wrong reasons. It shattered Pandora at such a vulnerable age that she never truly got over it. She blames Kenna for the person she became after he was gone, holding on to the hate as a defense. It’s a story she kept to herself, hiding it from even her closest friends. He’s ruined me for all other men. He’s stopped me from being the woman I could have been. Mackenna suffered as well. When you find out why he left you’ll understand that he thought he was doing the right thing. He had something to prove, and he never intended it to be forever, but life happens. Six years later when they meet again there’s a lot of damage that needs to be repaired. Both of them still feel an almost magnetic pull and attraction, but they cover it up with bickering and insults for quite a while. It was both entertaining and difficult to read the struggles they were going through…each of them trying to maintain an emotional distance. I have to give props to Mackenna for not giving up even tho it seemed it might be the wisest option. I truly felt for Pandora many times, but I also wanted to shake her as well. I felt such relief when it finally seemed as tho her heart might be reawakening, and opening up to the possibility that maybe…just maybe there was more to the relationship than just casual albeit super hot sexuality between them. Katy threw in a real curveball towards the end, and I admit I was scared how it was going to play out. It was handled beautifully, but my heart took a beating while reading it. I also need to mention that it was really wonderful when the other characters from this series made their appearances. I’ve grown so fond of all of them, and I think they add meaning to the storyline as well as to the wonderful continuity that I appreciate as a reader. They’ve all had such different paths to finding true love, but the connection between all of them has enhanced the entire series. Ripped is an amazing story about forgiveness and the healing power of love. Second chances are never guaranteed and shouldn’t be squandered. Sometimes in life and love you have to take the risk in order to receive the ultimate reward…your soulmate. I’m grateful that neither Pandora or Mackenna screwed up their second chance, because this couple truly deserves a happily ever after. Katy has crafted another gem that I’m so thankful to have read. I’m giving it my highest recommendation for you to experience it for yourself. Later on today Gel has a very special treat for you + a giveaway you won’t want to miss out on, so stay tuned! This entry was posted in Adult Romance, Badass, Book Crushes, Book Recommendation, Books, Favorite Authors, Katy Evans, Reviews, Ripped, Rock Star and tagged Adult Romance, Badass, Book Crushes, Book Recommendation, Books, favorite authors, Katy Evans, reviews, RIPPED, Rock Star.